I finally took an hour or two to visit the Old Adelaide Gaol a few weeks back. It was an eye opener for sure. The most intriguing thing to me was an artwork that has been in storage (for who knows how long??) in the laundry area of the gaol, which incidentally is not open to the public. The artwork is a sculpture made from wire, and is a large bell shape, possibly 2 meters high? 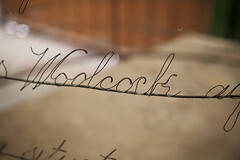 The wire is twisted into letters, forming words, making up the letter that was written by the only woman to be executed in South Australia, Elizabeth Woolcock. She was convicted of murdering her husband by slowly poisoning him with mercury. The full story can be heard here, and the letter here. I would love to know who created the work, why, when, and how it can be restored and displayed for the public somewhere, such as the SA Museum or Art Gallery. 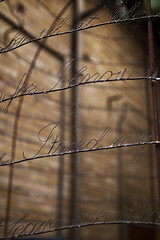 More photos from the gaol can be seen on my flickr photostream. Adelaide Gaol is one of South Australia’s oldest and most intriguing public buildings. It operated from 1841 – 1988, housing approximately 300,000 prisoners. Step inside for a unique glimpse of prison life. See original cell blocks, 19th century architecture, the hanging tower, yards, gallows and prisoner graves. Explore the site in your own time, join a tour or see the Gaol in a more eerie light on a night tour. Located in the Adelaide Parklands, the gaol is a short walk from bus stop 1 on Port Road. Buses run frequently from the city to the Gaol Road / Port Road intersection.